One day my mom left a papaya on a plate for me. There was a whole and there was a half, her idea was if I saw what it looks like inside I will be curious to find out how it tastes. This kind of motivation never struck me. I dislike fruit. She pleaded to the papaya to convince me. The papaya played the disappearing game. I looked the other way. Me: How do you know you are a healthy fruit? 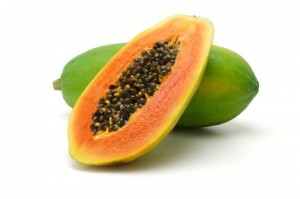 Papaya: Everyone says my flesh is tasty and healthy. Me: Really, did they say you smell? Papaya: No, this is a dumb question. Me: You know I am right. I want you to disappear for good. Papaya: One day you’ll look for me in the supermarket and won’t find me, guess what I’ll say; sorry chum you should’ve tried when you had a chance.